This photo is from page 17 of the "GM New Look Bus" by McKane & Squire (of which credit is due for educational purposes) with no identification of any bus company associated with it. One can assume that it's Suffolk County in origin mainly by the Ronkonkoma destination sign. 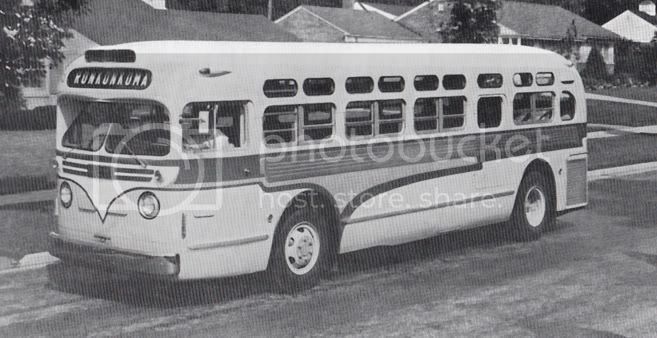 Anyone have more information on this bus? It looks very much like a typical GM builder's shot as evidenced by the lack of either company flag or license plate. However, I think you're right when you say Suffolk County because I don't know of any other Ronkonkoma in the world! Records do show that Babylon Transit did buy two TDH 3714's numbered 36 and 44 in the mid fifties. Babylon Transit #36 was from 1955 and #44 was from 1956.